Danny Boyle denies his ‘national treasure’ tag. A knighthood, surely for the euphoric effect his Olympic opening ceremony had on us last year, wasn’t his ‘cup of tea’. So reserved from following the celebrated path effectively laid out before him (a path that probably ends with a statue being erected in Trafalgar Square) that he bypassed following up his Oscar-hoarding Slumdog Millionaire and heroic 127 Hours with a similarly jubilant picture, Boyle negates the jingoism he so articulately expresses in those works with a cool, deeply psychological thriller with a dark heart – with not a winged cyclist in sight. 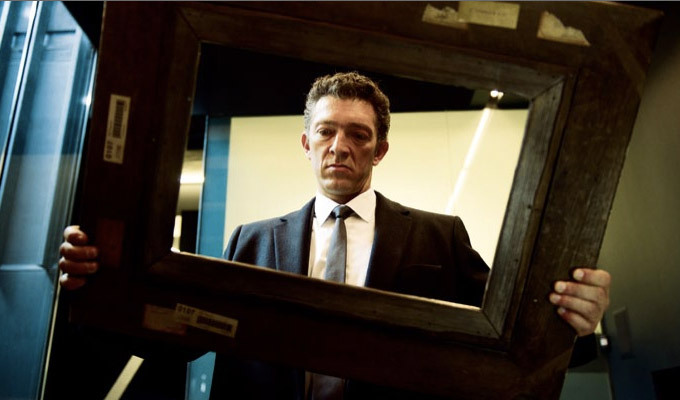 Filmed in conjunction with the Olympics and his stage version of Frankenstein, Boyle had a lot on his plate when shooting James McAvoy, Rosario Dawson and Vincent Cassel on location around London, not to mention getting his head around the zig-zagging script; McAvoy plays Simon, a crooked arts dealer who fudges a set-up for the theft of a Goya painting when he forgets where he stashed it. ‘Oops’ doesn’t begin to cover it, especially when Cassel’s calmly vicious Franck turns to ripping fingernails off their respective digits in order to apprehend Simon’s elusive memory; that is until Dr. Elizabeth Lamb, played by a never-been-sexier Dawson, is employed to hypnotise him to get inside his brain, retrieve the painting’s location, and make a lot of cash for everyone. It sounds straight-forward on surface level, but this is Inception on the streets of London, hand-in-hand in disposition with Boyle’s debut Shallow Grave; dastardly individuals nicking money from the other’s pocket while they in turn have their own brain fiddled with. We constantly question the character’s motives, but it’s executed in such a deliberate, intelligently plotted way that this doesn’t affect our identification with them; we see our own greedy selves mirrored in their increasingly fractured personas. Their actions define them, but again it’s not all black-and-white, but more of a greyish fuzz, pulsating like a migraine. At points, you’ll feel like a particularly painful one’s coming on – Trance does start to creak due to its frivolous plying with reality, but too infrequently for the strands to fail to come together, strands of which can’t be explained further here; to do so would be to spoil the adrenalin-fused – and moving – reveals of the movie, which Boyle has managed to sweetly coaxe out in the editing suite. We feel we’re getting closer to the secrets that the film holds, only to be led tantalisingly down another unexpected route. Like Simon tapping on the car window in one of his trances, we’re searching for the answer with him. But despite all the grim, neon-drenched imagery and calculatedly evocative music (which is never a bad thing in a Boyle film), there is an underlying predilection with – and a unique angle on – the human condition. The same way his movie Sunshine (2007) is less about kick-starting our sun and more about touching God, this isn’t a movie about an art robbery; it’s a film about how messed up we can all be at times in our life, the lengths we go to to avoid those times, and the redemptive ability of being able to look back at it all – envisioned and captured through the multi-faceted prism of the mind. Simon’s own mind is a beatifully tormented thing to watch unfold like a playground fortune teller; McAvoy portrays him equal parts likeable and untrustworthy, a commendable feat, while Dawson and Cassel provide the two emotional pillars he orbits intractably with compelling (and complex) identities of their own. And that’s what Trance, ultimately, is about; identity. The phrase ‘no piece of art is worth a human life’ is repeated a handful of times throughout; it’s Boyle’s way of asking us, ‘but is it really?’ What is a personal identity when compared to something that has inspired many identities? That’s what he’s trying to find out. Boyle is casting his own hypnotic spell, to be able to delve deep, come back, and tell us. Tap, tap, tap.